← Which US City Has the Worst Drivers: No Weather Variable? Should the Baseball Hall of Fame Change Its Voting Rules? A couple of days ago, three former MLB players were inducted into the hallowed halls of the National Baseball Hall of Fame. All three of these players weren’t able to attend the ceremony as they all had passed away more than 70 years ago. It’s unfortunate that these Hall of Famers weren’t able to receive the recognition (in person) that they earned. There was an article on SB Nation about a week ago that argued for changing the way the Hall of Fame voted. That is, the Baseball Hall of Fame has some of the most strict guidelines (among pro sports) when it comes to voting people into the Hall of Fame. Part of the argument is that it’ll make the ceremony much more exciting for those who attend and for the sport of baseball. As someone who’s played baseball for a good part of his life, I can probably count on one hand the number of times I’ve watched the Baseball Hall of Fame induction ceremony. That’s not good for the Hall of Fame nor is it good for baseball. Another argument is that, in some years, there isn’t even anyone elected to the Baseball Hall of Fame. And while that may have been necessary when there were only 16 teams in the league (55 years ago), there are now almost double that amount (30). 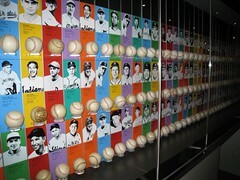 In baseball, a player needs to be voted into the Hall of Fame by more than 75% of the people voting (the Baseball Writer’s Association of America). The author used the example of Craig Biggio who appeared on the ballot for the first time this year (players have to wait 5 years before they can appear on the ballot). Biggio earned the most votes of those on the ballot, but he didn’t meet the 75% threshold. The eligible players should be voted on individually, not as a group. It makes no sense that a vote for Mike Piazza is a vote that can’t be cast for Craig Biggio or Roger Clemens. They have nothing to do with each other. Their candidacies have nothing to do with each other. They should not be limited by a finite pool. They should not have to compete with each other for votes. They should stand on their own merits. Like I said earlier, I haven’t been following the Baseball Hall of Fame that closely, so I don’t know if this idea’s been proposed in the past. It sounds pretty good to me. Of course, I’m sure there’s a good counterargument as to why it’s not done this way, right? Every year, around November, the BBWAA gets a vote, living HoFers get a vote, current and retired broadcasters get a vote, retired MLB coaches, managers and executives get a vote, retired players get a vote, and the FANS who pay the FREIGHT get a vote to, by consensus, determine the 12 most eligible players to be considered for HoF induction. Then starting in January, the votes are done, one player per month, by the BBWAA, 75%, up or down, in or out. For four weeks there is a national debate. First up: Barry Bonds. In or out? Let the sides argue. At the end of four weeks, ESPN hosts a two hour special on Sunday night. The first hour is a retrospective of the player’s career. The next half hour is a debate among three or four BBWAA members, for and against the player’s induction. The final half hour is the actual vote, carried live and with names and votes tallied in real time, so we can see who the assholes are, as the player himself watches and comments on the voting. No more of this making the announcement anonymously on a Tuesday afternoon. If the player gets 75%, he’s in. If he doesn’t, he’s ineligible for another five years. If he doesn’t make the consensus final ballot in five years, that’s it. He’s done forever. Again, some really interesting ideas. This could be a way for baseball to reclaim its fan-base (or maybe get some new fans?) It’d certainly be entertaining to watch what this commenter proposed. Of course, before making these kinds of drastic changes, questions would need to posed and answered about the purpose and virtue of the Baseball Hall of Fame. Is it meant to honor former players? And if so, is it sullying to use it as a way to draw in more fans? This entry was posted in Sports and tagged Barry Bonds, Baseball, Baseball Hall of Fame, Baseball Writers Association of America, BBWAA, Craig Biggio, ESPN, Hall of Fame, Mike Piazza, MLB, National Baseball Hall of Fame and Museum, Roger Clemens, SB Nation. Bookmark the permalink.